OK, I’ve been making legwarmers as gifts for my daughter’s dance teachers, so I have for you here another legwarmer pattern. They are worked in the round with a simple spiral lace pattern which wraps up the legs in opposite directions. Needle: size 8 – 5mm(circular or DPN for your preferred method of working in the round) I used 2 circular needles, but 2 at a time (on 1 circular with Magic Loop or 2 circulars) doesn’t work because of the lace pattern. ssk: slip next 2 stitches one at a time as if to knit, Insert the left needle into the fronts of these two stitches and knit them together. Work in 2×2 rib for 4.5 inches. Work 2×2 rib for 4.5 inches. Cast off using sewn bind off (or your preferred stretchy bind off method) and weave in ends. April 23, 2010. Tags: free, Knitting, lace, legwarmers, pattern. Knitting, patterns. Thanks so much for the pattern it is soooo cute!!! I just finished test knitting a spiral hat it is cute too!! April 24, 2010 at 6:16 am. Permalink. Hi. I’m in NZ, and don’t recognize Caron brand of knitting wool. I don’t think it’s sold locally. What ply is it please? Thanks. May 6, 2010 at 10:34 am. Permalink. Hi…sorry about leaving that bit of information out. It is a Worsted / 10 ply yarn. May 6, 2010 at 11:45 am. Permalink. I can’t wait to make these legwarmers! They are beautiful. However, I do have a question. The pattern says that the even rows are knit, but to be stockinette stitch, wouldn’t they have to be purled? I’m new to knitting, so forgive me if I’m wrong. May 7, 2010 at 3:36 am. Permalink. May 7, 2010 at 11:59 am. Permalink. Thanks for sharing your lovely pattern. My daughter takes Irish Dance and I think these will be nice for her during the warm up. June 11, 2010 at 12:54 pm. Permalink. I’m not skilled in knitting in the round… and modified the pattern to knit on regular needles by purling the even rows, and sewing them together. December 13, 2010 at 1:58 am. Permalink. These look great! I’ve been looking all over for a legwarmer pattern to make as a birthday present for my mom and this is perfect. I have a quick question though. Do you have any idea roughly how much yarn it takes to knit this pattern? Thanks! June 11, 2010 at 6:22 pm. Permalink. I used a little less than 300 yards. June 11, 2010 at 7:18 pm. Permalink. July 26, 2010 at 4:18 am. Permalink. July 12, 2010 at 11:43 pm. Permalink. Absolutely – you can repeat the spiral pattern, also you could make the ribbing sections longer if you wanted to give it some more length. July 13, 2010 at 1:16 am. Permalink. Hi – I really loved this pattern. They knitted up so quickly (once I got the pattern repeats down). I had a hard time after the 13th round. I moved the st-m over as you mentioned in your pattern but I still got a jagged flow of the eyelettes. I finally finished the legwarmers by moving one st over to the last dpn at the end of every K round. How can I measure the no of STS to CO according to number of inches my calf measures? Is the pattern a mult of 8 for adults and 6 for children? July 26, 2010 at 4:14 am. Permalink. Thank you for trying my pattern. Yes, the pattern is a multiple of 8 for the adult size, and a multiple of 6 for the child size. As for the jagged eyelet pattern…I think I need to knit up a sample to see if I can replicate your problem and explain how I did it. I’ll get back to you as soon as I can. July 27, 2010 at 9:13 pm. Permalink. September 22, 2010 at 9:30 am. Permalink. When you finish the round you’ll physically move the stitch marker one stitch over (you’ll be changing the spot that is the beginning of the round) Then the lace pattern will be uninterrupted when you start the next repeat. November 8, 2010 at 1:20 pm. Permalink. 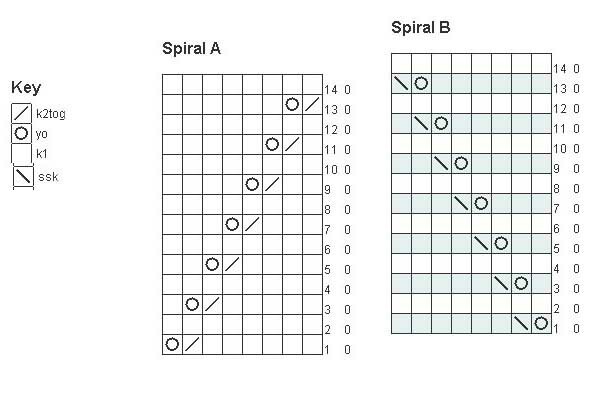 Does this mean that you will have to move the stitch marker 4 times at every repeat of the spiral pattern? Or do you just move it the one time for the rest of the pattern? January 19, 2011 at 5:59 am. Permalink. You will have to move the stitch marker at every repeat of the spiral pattern. January 19, 2011 at 1:08 pm. Permalink. November 21, 2013 at 2:09 pm. Permalink. November 3, 2010 at 8:52 pm. Permalink. Hi, I live in the UK, you say to use size 8 needles. What size is this in metric please? November 6, 2010 at 11:38 pm. Permalink. US8 needles = 5mm. Sorry for the oversight! November 7, 2010 at 12:36 am. Permalink. Love the pattern …. am knitting them for Christmas gifts and ready to knit the second ribbing … but have two questions …. I know this is subject to personal preference , but what is the finished length ? Also …. not familiar with ” sewn bind off ” … and can’t find a listing anywhere on Ravelry . November 8, 2010 at 7:25 am. Permalink. The finished length was about 14 inches for the adult size, if I remember correctly. And I added a link to the sewn bind off instructions. You can also use a different bind off if you have a stretchy one that you like. November 8, 2010 at 12:52 pm. Permalink. November 9, 2010 at 2:50 am. Permalink. November 9, 2010 at 3:26 am. Permalink. November 11, 2010 at 5:36 pm. Permalink. Can you do these on a single size 8 cn? What length would I use? November 16, 2010 at 4:44 am. Permalink. It’s pretty narrow, so I don’t know if you can use one circular without using magic loop. I have 32″ length circulars and that would work for magic loop. November 17, 2010 at 8:17 pm. Permalink. I was wondering if anyone else had an issue with row 1 having 4 left over stitches at the end? I think this may be because of the yo as it’s increasing by one stitch so when i started out with 8 stitched now I have 9. November 28, 2010 at 3:56 am. Permalink. Each increase is paired with a decrease. On the right legwarmer, before you make the yo you need to knit 2 stitches together. This maintains the stitch count and creates the ridge along the spiral. November 28, 2010 at 2:15 pm. Permalink. Hi! Love the pattern! I’m assuming that you say that 2 circs for 2 at a time knitting won’t work because the pattern must be worked differently for each leg. Is there another reason? If Ipay close attention to which leg I’m working on, and don’t mind frogging when I inevitably goof, 2 at a time shoiuld work, shouldn’t it? I ask because I’ve been known to knit the second of a pair (or sleeves, for that matter) at slightly different guages and while it’s not enough to affect the fit, it could be enough to affect the pattern. If there’s another reason for not doing them 2 at a time, please let me know. I consider myself an intermediate knitter and adventurous by nature, but not expert enough to be sure I’ve not missed some subtlety in the construction that really would make 2 at a time impossible. Thanks! February 5, 2011 at 8:30 pm. Permalink. 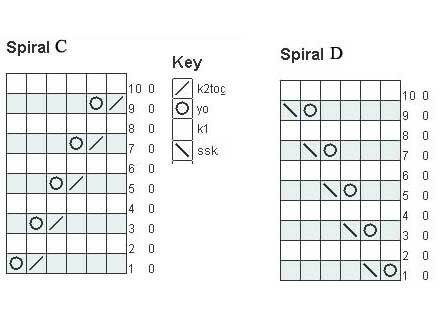 Actually, it won’t work 2 at a time because the beginning of the round changes after each repeat and a stitch needs to be moved from one needle to the other to complete a k2tog/ssk…which I wasn’t able to do when I tried it 2 at a time. February 5, 2011 at 8:54 pm. Permalink. Aha! Thank you for enlightening me. I’d have been in sad shape for sure had I started them 2 at a time. Now, off to cast on and get started! I’m using KnitPicks Andean Silk in a mauve-gray and can’t wait to see how they look on my friend! February 6, 2011 at 6:12 pm. Permalink. I love the pattern. 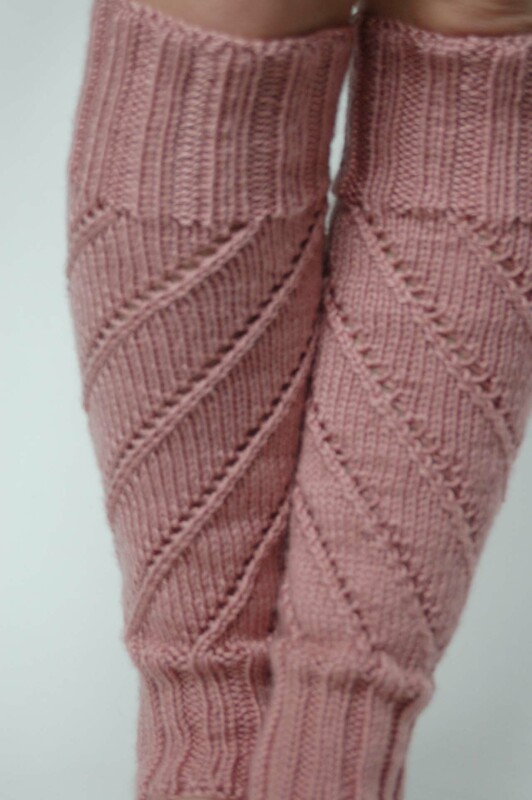 Can I make the leg warmers without using Circular or Double pointed needles? February 6, 2011 at 11:46 pm. Permalink. You can’t make them with straight needles as the pattern is written. You’d have to add some edge stitches to adjust the lace pattern for working flat and then seam it up. February 8, 2011 at 1:58 pm. Permalink. Thanks for the pattern. I’m new to knitting and I’m making these legwarmers for a friend who takes ballet. I’m a little confused though, aren’t they going to turn out to be very long legwarmers? I’m already through 3 repeats of the spiral on the first leg and getting worried. With 2 x 4.5 inch cuffs, plus the spiral repeats at around 11 inches, the finished leg warmer will be 20inches long. Maybe I am short, but doesn’t that seem long for a legwarmer? Does it shrink when washed? If not I may shorten it up a bit. I’m also knitting using 4 DPN (16 stitchs on 3 needles) and have somehow got to a point where I don’t need to move the stitch marker and just repeat round 1 over and over. I’m assuming it’s because I lose a stitch at the end of each DPN for the k2tog, then add a stitch to the next DPN with my yo. Whatever I’m doing it makes remembering it a lot easier! April 7, 2011 at 10:59 pm. Permalink. I gave credit in my listing. Thank you for sharing! October 29, 2012 at 1:08 am. Permalink. Such a cute pattern. Will try to use it for a matching hat. Do you have a pattern for that already. February 3, 2014 at 12:09 am. Permalink. February 9, 2014 at 11:14 pm. Permalink.